BART’s new train cars are on display today at Justin Herman Plaza from 11 a.m. to 7 p.m. You can swing by to take a look at the new design, which is slated to go into service in 2017, according to the SF Appeal. Take a virtual tour yourself in this video captured by Oakland Tribune’s @Tyska. In another video by @Tyska, people in wheelchair test out the new BART car design. Passengers report that Montgomery Station has re-opened after the person under the train was transported to the hospital. @SFBART says that service restoration is in progress. 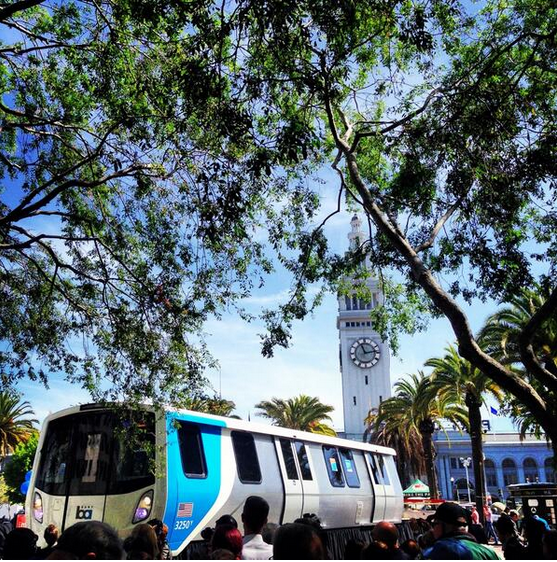 KTVU reports that although the station has re-opened, other stations are still jam-packed with passengers. 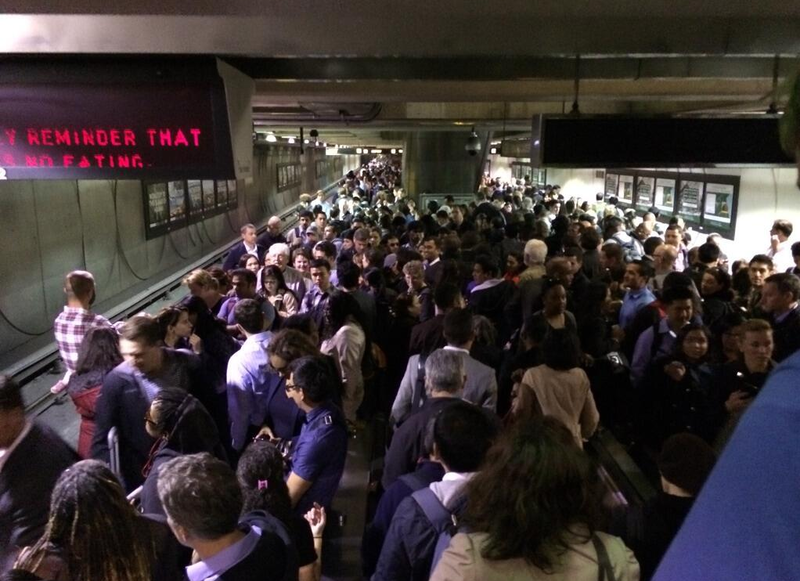 Riders are packed at other BART stations due to the Montgomery Station closure, as seen in the above photo from the Embarcadero Station from @JimMcNutty. 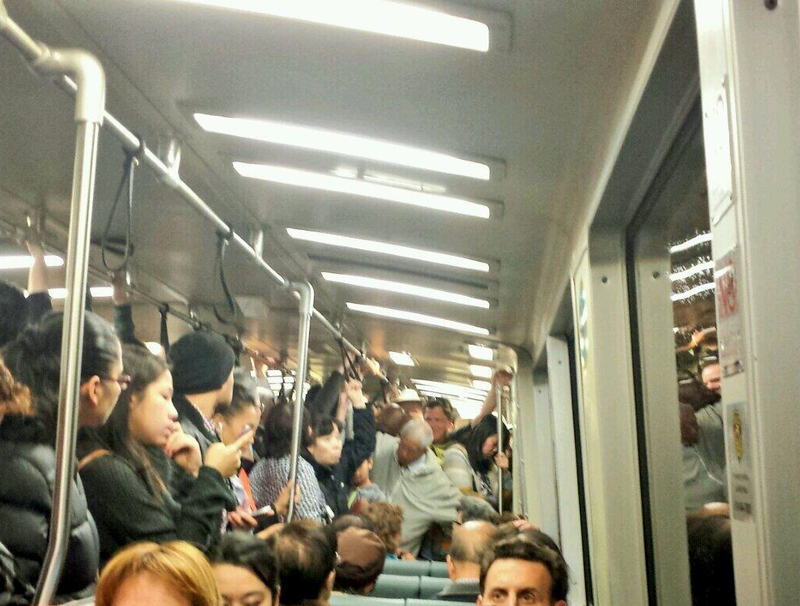 The Montgomery BART station is currently closed after reports that a person is under a BART train. Fire trucks and police vehicles are in front of the station, as witnesses on Twitter report. As of 5:32 p.m., the station is still closed and there are delays SFO, Daly City, and Millbrae bound trains, according to KRON4. In the photo below, passengers are jam-packed in the train as they await for the delay to clear up. The Chronicle’s Vivian Ho tweeted that the person under the train is still alive and being transported to a hospital to treat for head injuries. Person under train at Montgomery station still alive. Transported to hospital with head injury. Station still closed for investigation.